The Official Website of the Government of Ekiti State, Nigeria » Ekiti State Government Commemorate 2018 16 days Of Activism Against Gender Based Violence. 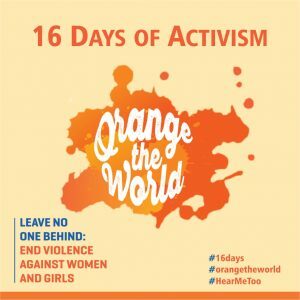 Ekiti State Government Commemorate 2018 16 days Of Activism Against Gender Based Violence. Speaking in Ado Ekiti, the Permanent Secretary in the State Ministry of Women Affairs, Social Development and Gender Empowerment Mrs. Peju Babafemi said that the campaign which is being spearheaded by the wife of the Governor, Erelu Bisi Fayemi commenced from November 25 till December 10, 2018. Mrs. Babafemi explained that the GBV campaign is an annual event designed to galvanize women and girls around the world. Babafemi said that the State would hold what she described as Agenda Setting Forum on GBV as part of the grand finale on Monday December 10. She stressed that the forum would address issues of implementation of Gender Based Violence Prohibition laws to end violence against women as well as highlight the roles of Civil Society Organisations in using Ekiti State Gender Based Violence Prohibition law to end violence against women. The Permanent Secretary added that the forum would also address the challenges affecting the implementation of the GBV prohibition laws. Other programs scheduled to hold during the period include discussion sessions on Radio & Television and Online Campaign. Expected Participants at the discussion media programs include representatives of the Nigerian Police, Federation of Women Lawyers (FIDA), NGOs, seasoned Civil servants and Politicians.